Along with everyone else on every side of the country these days, The Legal Genealogist has been keeping an eye on the weather. With Harvey having hammered the Gulf Coast, and Irma threatening the east, and wildfires raging throughout the west, the Pacific Northwest and California, weather is very much on all of our minds. From the images on our television sets and computer screens to the words of weather commentators on our radios and even to broadcasts we get on our smartphones and smart watches, we are all constantly up-to-date with the weather. I for one am preparing to head out to San Diego for this weekend’s Fall seminar of the San Diego Genealogical Society (and tomorrow is the last day to register online… just sayin’…) and I can simply click through and see that the forecast is for sunny skies. Colleagues and friends of mine who are headed towards conferences and meetings, or who live, in parts of Florida are doing the same thing as they watch Hurricane Irma on approach. For us as genealogists, knowing what the weather was for our ancestors helps us understand what their lives were like. The storms they faced. The crop losses that forced them off the land. The balmy days and weeks that made life a joy. So… how do we get historic weather information? In some cases, we get it handed to us on a silver platter. If your folks were in San Diego, California, from the first day of March 1872 through the 28th of February 1873, you can find out exactly what the temperature was at 7 a.m., 2 p.m. and 9 p.m., each and every day, by consulting a single reference work. It was published by the San Diego Chamber of Commerce, and printed by the San Diego Daily Union, in 1874 under the lovely title Information Relative to the City of San Diego, California, Illustrated with Twenty-Two Photographic Views, Containing, Also, A Business Directory of the City.1 And it’s digitized, available free online, on Google Books. And if you’re looking for more than that one year? Oh, there are a lot of possibilities. A website called Calclim, the California Climate Data Archive, can serve as a portal to a lot of different data sets. Looking, for example, at the NWS Coop links on the CalClim Station Map, you can drill down to individual weather reporting stations throughout California. Data was recorded in Bonita, for example, and is available from 1915 through 1970. Clicking through to that station and then choosing Monthly Precipitation, you can see that January 1916 was a really rainy month: a record 10.29 inches of rain. And both Bonita and Chula Vista reported high rain levels in general in February. The NWS, of course, is the National Weather Service, now part of the National Oceanic and Atmospheric Administration (NOAA). You can get a history of the National Weather Service at its website. Although the website tends to be really slow these days, there’s still a ton of good information there. 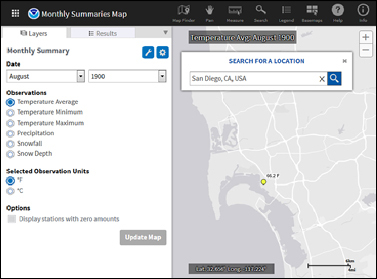 Want to know what the average temperature was in San Diego in August 1900, for example? Try the Monthly Summaries map of NOAA’s National Centers for Environmental Information (NCEI). Beyond the government sources, check out websites like Weather Base — it has some 30 years of weather records for San Diego and at least some data for more than 41,997 other cities worldwide. WeatherForYou has a daily bit of weather history (for today, those of you coping with the fires in the west can know your ancestors did the same: in 1881, “Forest fires in Michigan and Ontario resulted in ‘Yellow Day’ in the northeastern U.S. Twenty villages in Michigan burned, and a total of 500 persons were killed”). Even the Old Farmer’s Almanac has some free historical weather data by states or by zip code. Weather it is… or weather it isn’t… weather is key to understanding our ancestors. Newspapers are great for finding out about storms,etc.in your ancestor’s location and timeframe. This one is going into my folder of background resources, Judy. One of the discoveries I made early on is old diaries, no matter who the author was. In past eras, gardeners and farmers (male and female) kept weather records, some simple, some quite detailed. Local historical societies may have these, or state or regional archives. For background details of a place and time period, they can’t be beat, regardless of who wrote them. And you never know: there might be a bit of juicy gossip or some delightful details of daily life or a special community event, too! I once unexpectedly came across one with some details about a 2nd great grandmother’s life that I am certain would never have been recorded otherwise. After immigrating to the Oregon coast in 1873, the ancestor I have researched enjoyed weather keeping. Once a newspaper said he was the second oldest weather keeper in the state! I have seen a few newspaper charts that he had published about weather highs and lows. I have also looked into whether anyone collects these “historic” weather record keeper so. That’s a terrific link to your ancestor! Thank you, Judy, for this valuable information. Of course, weather was a key part of the environment in which they spent their lives. They were not insulated from it in the way which we are today. My wife follows you regularly, and sent your comments on to me. I did not see mention of the key source of weather/climate data. the National Climate Data Center at Ashville, NC. Of course their name, and maybe location, may have have changed since I spent time there when an agricultural climatologist at the University of Missouri – in the 1980’s! We all need to become more aware of the impact of weather/climate on our own lives, given the present and future changes which we will be seeing. You can tell your wife (or perhaps she will read here) that the National Climate Data Center is now part of NOAA’s National Centers for Environmental Information (https://www.ncdc.noaa.gov/).